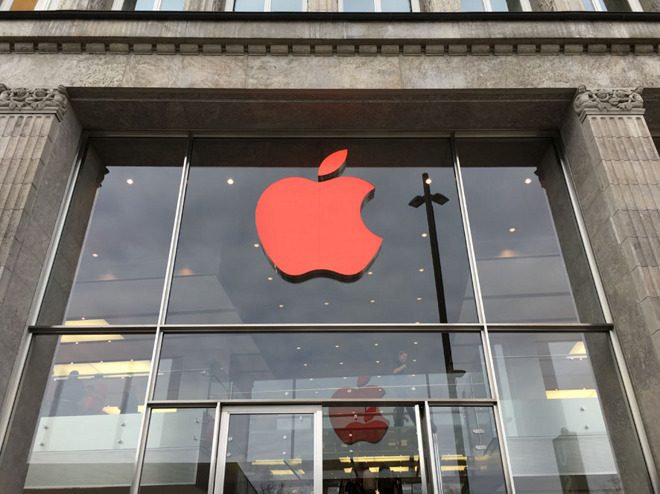 Maintaining a four-year-old tradition, Apple has changed the logos outside of a number of its retail stores from white to red in order to signal World AIDS Day, simultaneously announcing that its (Product)Red donations have topped $100 million. Stores with red logos range from the company's Fifth Avenue flagship in New York City to locations in places like Australia, Belgium, Germany, and Japan. World AIDS Day dates back to 1988, and is an event created by the World Health Organization to draw attention to HIV/AIDS and its victims. On its website, Apple is today focusing on its participation in (Product)Red, a program which donates some of the proceeds of various products to the Global Fund to fight AIDS, malaria, and tuberculosis. Only iPods and a handful of accessories have Red options, and indeed the company only released qualifying iPhone 6s and 6s Plus leather cases on Monday. The site is also where Apple noted that its contributions have surpassed $100 million. Apple first joined (Product)Red in 2006, and until now the most recent donation total for the company was $70 million, revealed in April 2014. In all, the Global Fund has received over $320 million from participating companies. On the App Store, meanwhile, developer Supercell is offering 100 percent of the proceeds from select Red packs in its games to the Global Fund. These can be found in Clash of Clans, Boom Beach, and Hay Day.